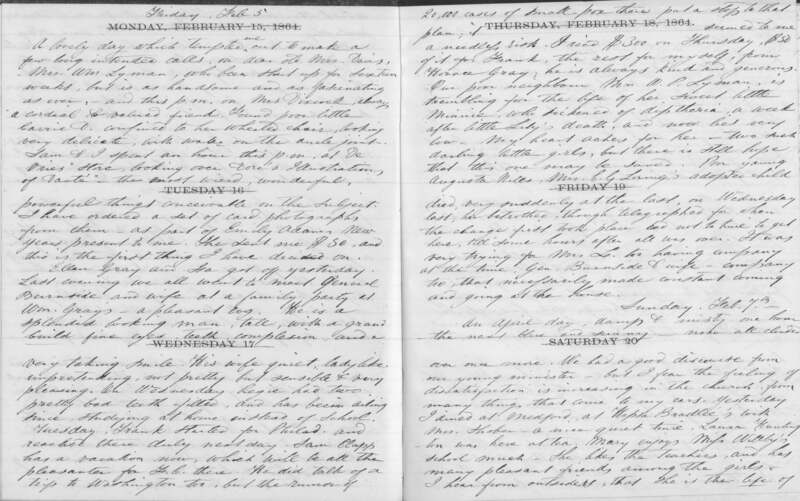 For the last six months or so, I have been engrossed in the daily diary of Hedwiga Regina (Shober) Gray (1818–1885), a Philadelphia-born Boston lady who wrote about her family, her household, and the larger world between 1860 and 1884. In almost a dozen blog posts I’ve quoted Mrs. Gray on contemporary celebrities (Mrs. Jack Gardner’s behavior merits a scolding for being “fast”; the diarist’s children see Tom Thumb perform and are “much pleased & amused”); on the danger of fire in the household (Mrs. Henry Wadsworth Longfellow is burned to death, while Eliza Winthrop survives a mattress fire); and on the painful grief associated with settling a beloved sister’s estate as relationships degrade between Mrs. Gray, her surviving sisters, and their younger brother. The Gray diary begins with the diarist’s children ranging in age between thirteen and three, and ends twenty-five years later with two of the sons married and raising children of their own. Mrs. Gray’s long marriage to Dr. Francis Henry Gray closes in sadness, after the doctor’s lengthy and debilitating illness, and the elderly lady who pens the 1880 entries seems more than a generation removed from the bustling young matron of 1860. The family’s economic position, so modest during the 1860s, improves somewhat as Dr. and Mrs. Gray receive family legacies; what helps even more, it seems, is that Mrs. Gray’s sons grow up and live at home until they marry, pooling their incomes to keep the family house in Beacon Hill Place (and, later, Mount Vernon Place) in comfortable order. Frank and Mary Gray, the two eldest children, are much in demand socially, but neither one chooses to marry, and it is interesting to see how Sam and Morris Gray conduct their courtships beyond their mother’s gaze: both engagements come as something of a surprise to Mrs. Gray. Is this diary going to be published, indexed, or searchable by name? How can others learn about the families mentioned in it? 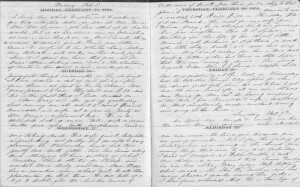 Katharine, I am preparing the first quarter of the diary for publication. The full diary merits a scholarly edition, in my view, but first we need to get the word out about Mrs. Gray and her remarkable diary. I hope a volume covering the Civil War will be a good introduction! It’s beautiful and fascinating. I can see why one feels so transported by Mrs. Gray’s words to another era, customs, and times. Your mention of each individual brings forth unheard conversations and observations that remind me of reverberating movements from “another room” and in the bigger picture of life. Katherine Young, who comments here, is so very right. The diary sounds like it should be published, though I daresay I would enjoy it more for the insight into these lives more than as a reference book. I wonder if you shouldn’t show it to PBS – it sounds like a potentially great program. That being said, I am off to study a bit on William Pratt Lyman – the Lyman Family has always been one of a great personal and ancestral interest to me. Really cool stuff Scott. Nice job. Or at least create an All-Name index as a searchable database here at the Society as publishing that diary in hard cover would be a massive (re annotation) and costly undertaking. But an index? Sure, as ‘twould seem Mrs. Gary was the Samuel Pepys of mid-19th century Boston. Her 18 year-old Philly Society Girl self really having always been near to hand emotionally within the 1882 matron; though WLP (HC ’82) must have been “striking”. Ah, Life! I am hoping to publish the first six years of the diary in one volume, after which perhaps there will be interest in a full-scale scholarly edition covering the 25 years of the diary.